This summer we will get to know nine of our teachers and three administrators as well all enjoy a beautiful summer in West Michigan! Please join us each week as we learn about their friends and families and how they plan to spend their summers recharging! This week we are getting to know Brooke Harvey, Jenison district Spanish teacher. 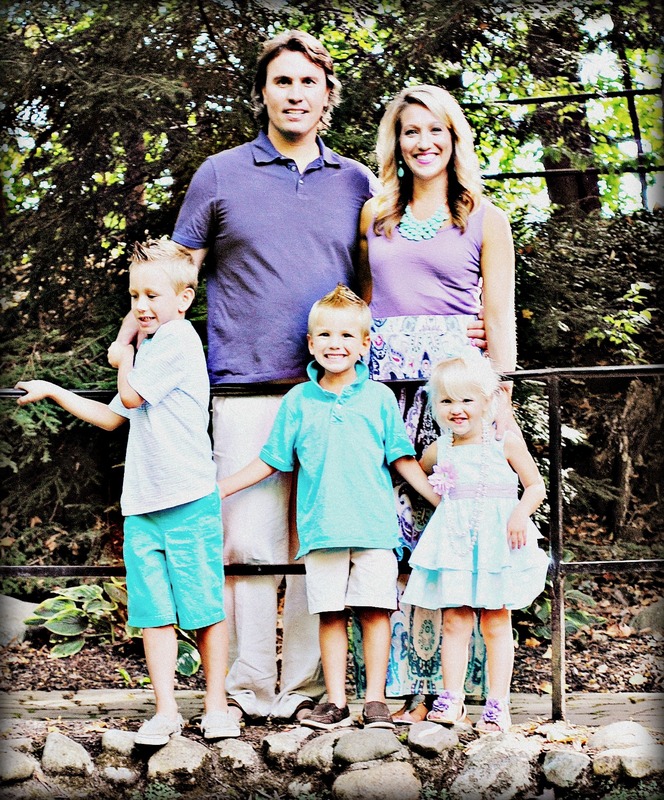 Brooke and her husband, Kurt, have three children: Gavyn, Braylen and Elle. Please us about your family and/or the people you plan to spend time with this summer. This July, my husband, Kurt, and I will celebrate 9 years of marriage. We have a six-year-old son named Gavyn, a five-year-old son named Braylen, and a three year-old daughter named Eliana (Elle). Gavyn is energetic-his mind and body truly move a zillion miles an hour-he’s uber creative, and he’s incredibly thoughtful. Braylen is totally a middle child. He’s easy-going, super silly, and very loving (Well, not so much to his siblings…). Elle is a little firecracker! She totally determined and way too smart for her own good. I am so, soooo looking forward to soaking up every second of the summer with my three busy babes! My idea of a “fun summer plan” is having NO plan! The school year is full planning and plans, plans, plans. I truly savor the days when I don’t have to wake to and follow a plan. That being said, I am certain my kids and I will do a great deal of pool and beach hopping, that we’ll spend many nights socializing with our wonderful neighbors while our kids tear up the neighborhood, and that we’ll spend many summer nights catching up with friends over good food, around a campfire, or in our hot tub. Every summer, my husband and I celebrate my birthday with a weekend get-away in late August. For this get-away, we always visit a different city on Lake Michigan. This year, we plan to visit Petoskey. I also plan to spend some time making hats. (In January, I started a little business called B Pretty: Inside & Up Top.) Basically, I embellish cadet hats, fedoras, and visors with handmade rosettes and a bit of bling. Though I have kept busy from Facebook advertising and word of mouth, I do plan to spend a bit of time beefing up my marketing strategies this summer. Have you lived in or visited anywhere exciting that you’d like to return to? There are two places I’ve lived to which I definitely plan to return in the near future. Nine years ago, my husband and I lived in Hendersonville, NC. Every weekend, we’d hike in the gorgeous Appalachian Mountains. We have been talking seriously about planning a trip back to NC this fall or next spring so that our children can experience the beauty of North Carolina and meet some of the wonderful friends that we made while living there. In my sophomore year of college, I studied abroad in Mérida, México for a semester. Next year, Kurt and I would love to travel to the Yucatan to celebrate our tenth wedding anniversary. Though I am sure we will stop in to visit my host family and friends for a day or so, I envision us spending the remainder of our time at all all-inclusive resort, soaking up the sun and sipping fruity drinks poolside. Well, one thing’s for sure: Using Technology with Classroom Instruction that Works will NOT be on my summer reading list. Puke! [I’m certain my fellow “TRIG survivors” will be able to relate!] If I’m in the mood for something heavy and moving, I’ll pick up something by Jodi Piccoult; If I want something that will keep me on my toes guessing, I’ll reach for a John Grisham novel; If I need to laugh out loud [and feel like I totally have it together! ], I’ll grab something by Sophie Kinsella.